Disclosure: The coupons for product redemption, information, and gift card have been provided by Oroweat® Bread so that I could try the product and share my thoughts and information aboutOroweat®. The opinions expressed in this post are my own and do not reflect the opinions of Oroweat® Bread. I love a good sandwich. Something simple yet hearty and delicious. 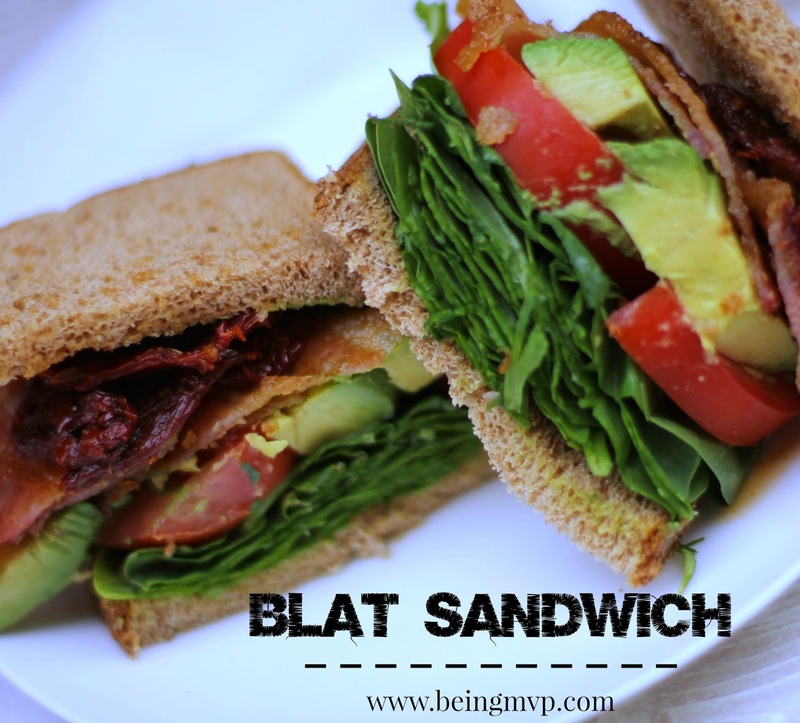 One of my favorites to quickly whip up is the BLAT sandwich. Check out my recipe and enter your own favorite into the Oroweat contest! Preheat oven to 400 degrees. Place bacon onto cookie rack/sheet and bake for 25 minutes or until crispy. Toast bread. 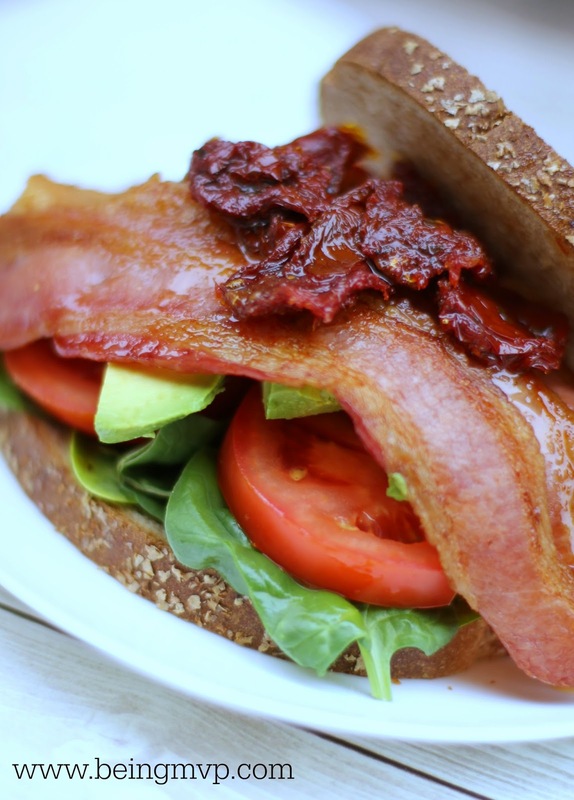 Layer spinach, slices of avocado, slices of Roma tomatoes, sundried tomatoes and bacon on top of bread. Cut in half and serve with your favorite side. I like potato egg salad. Enjoy! Do you have a killer sandwich recipe? Enter the America's Better Sandwich contest by Oroweat® Bread where one grand prize winner will get $25,000! There are four (4) sandwich categories in the Oroweat® “America’s Better Sandwich” Contest including:“Creative Classic” (a healthful twist on a sandwich that has been around for more than two generations, such as a Reuben, BLT or club sandwich), “Stealthily Simple” (maximum of five (5) ingredients), “Fueling Good” (ingredients that help boost your energy such as healthful fats, protein, fiber and iron), and “Meatless Marvel” (no animal products including land and sea animals may be included in the recipe). Entries will be accepted July 23rd - August 22nd, online consumer voting will take place September 22nd - October 17th, and the winners will be announced on National Sandwich Day- November 3rd. What's your favorite sandwich? Your favorite Oroweat® Bread? One winner will Receive a $25 Visa gift card and three $5.00 coupons for Oroweat® Sliced Breads and three $4.00 coupons for Oroweat® Sandwich Thins® Rolls! I would enter a shrimp salad sandwich recipe. I would enter a panini sandwich with chicken and spinach.. I'll entered chicken Caesar sandwich. I would enter a lobster meat sandwich recipe. I would make a turkey sandwich with provolone, bacon, and avacado on whole wheat. Probably a fancy grilled cheese with hummus, pear and roasted veggies? I would enter a meatloaf sandwich recipe. I'd enter one in the Stealthily Simple category -- I love sandwiches and I love simplicity. It would include cucumbers and tomatoes for sure! I would enter a fresh mozzarella, tomato and basil sandwich. I don't have any unique sandwich recipes ....except for peanut butter & pickle sandwiches but most people think that's nasty! I would enter a Progresso Chicken Salad that is so good. I would do a peanut butter, marshmallow fluff, and maple bacon sandwich with bananas. Turkey and ham club with avocado! I would make a chicken salad with cranberries. I would enter a Caesar chicken sandwich. I make a mean tuna salad sandwich so I would probably enter that. I have a recipe for chicken salad that is amazing. I would enter a PB, banana, jelly, & fluff sandwich. I'm not a creative cook, but I would enter my delicious curry chicken salad. I'd enter my olive spread sandwich. I'd enter a grilled cheese with some exotic cheese and apples. I'd enter a roasted red pepper, turkey and bacon sandwich. I would enter my French Dip with Au Jus recipe into this contest. I'd enter my chicken & egg salad recipe. i'd do a roasted turkey with avocado tomato swiss cheese on salt rising bread! I would enter my grilled chicken sandwich with ranch recipe. I'd enter my Chipotle Fried Avocado sandwich! I have a great eggplant sandwich I am going to enter, I just need to think of a name. I'd enter my chicken salad ranch sandwich.